These wonderful holiday cards are great fun for the whole family. 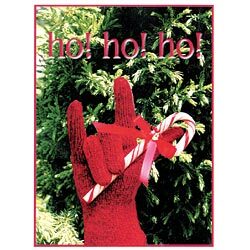 The front of the card has a wonderful holiday scene with the words, Ho Ho Ho and the universal sign for I Love You holding a candy cane in front of a beautiful Christmas evergreen. Pack of 10 cards.